Prior to animal studies, as a part of an in vitro campaign, studies were performed to define the most relevant effector molecules (TNF superfamily: Fas ligand, TRAIL etc. ), the concentrations and conditions for the murine studies. 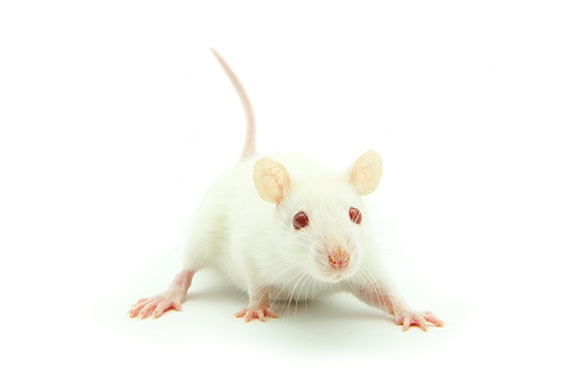 Following that, a large number of animal studies were performed in order to test the technology in murine and human transplant models, while using various sources of human hematopoietic cells (mobilized peripheral blood, bone marrow and umbilical cord blood), relevant donor types (self, family and unrelated) and measuring the relevant adverse effects (GvHD, mortality, engraftment and anti-tumor effect). Using the most stringent conditions for GvHD, mortality rates were reduced from 80% to none. Inherent insensitivity of stem cells to receptor-mediated apoptosis is actively sustained by up regulation of anti-apoptotic mechanisms at the transcriptional level. The immuno-hematopoietic progeny becomes gradually sensitive to receptor-mediated apoptosis concomitantly with their differentiation. Apoptosis-insensitive progenitors are privileged for engraftment through competitive advantage over the apoptosis-sensitive differentiated progeny. Selection of stem and progenitor cells based on insensitivity to receptor-mediated apoptosis from all sources. Ex vivo selective depletion of GvHD effector cells. Accelerated engraftment by ex vivo treatment of umbilical cord blood. Graft versus Host disease (GvHD) is a common complication of allogeneic (non-related) as well as haploidentical (family member) stem-cell transplantations in which T-cells present in the graft launch an immunologic attack on the host. GvHD reactions are very common, and in most cases they create a debilitating chronic disease which requires continuous immune suppression and may evolve into a life-threatening acute disease. GvHD is the most serious drawback of bone marrow transplantation and the main reason why this life saving procedure is currently used only for life threatening conditions (mainly cancer). 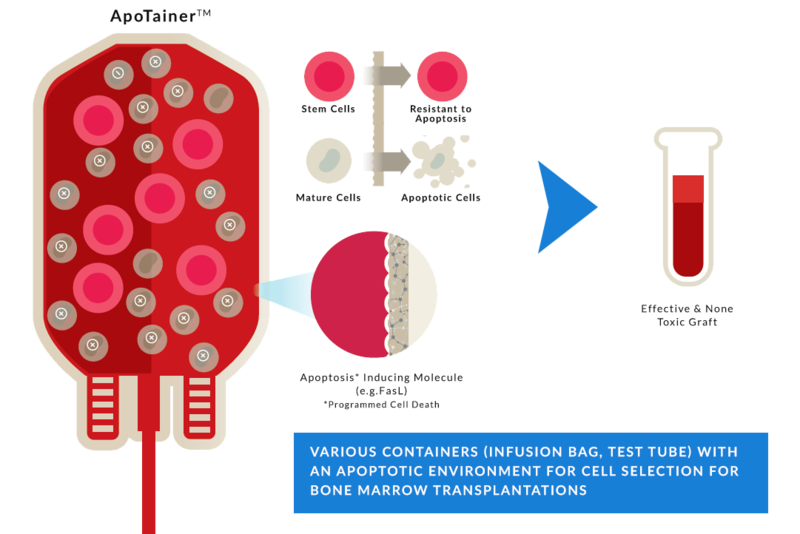 A medical device to be used in BMT lab research. 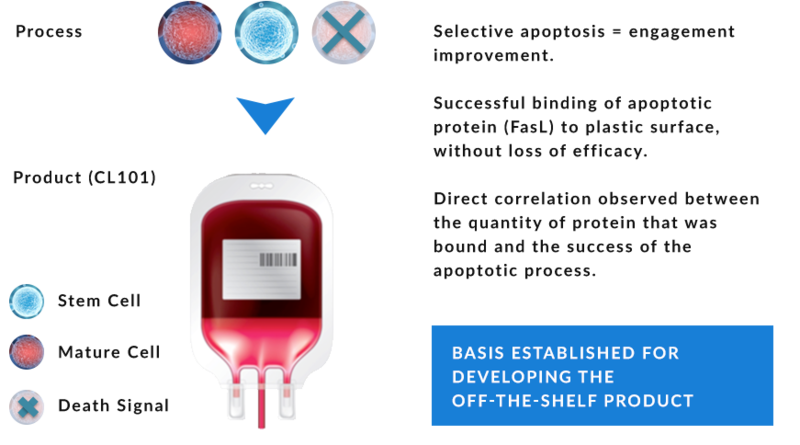 This product will be complementary to the Company’s main product and is intended for use in the same clinical indication and lab setup, allowing researchers to enjoy dramatic reduction in transplant rejection and improved engraftment following stem-cell transplantation. Use of stem and progenitor cells as a platform for drug delivery for cancer treatment based on the homing capabilities of stem cells. Development of multi-step approach that uses BMT to cure type 1 diabetes. 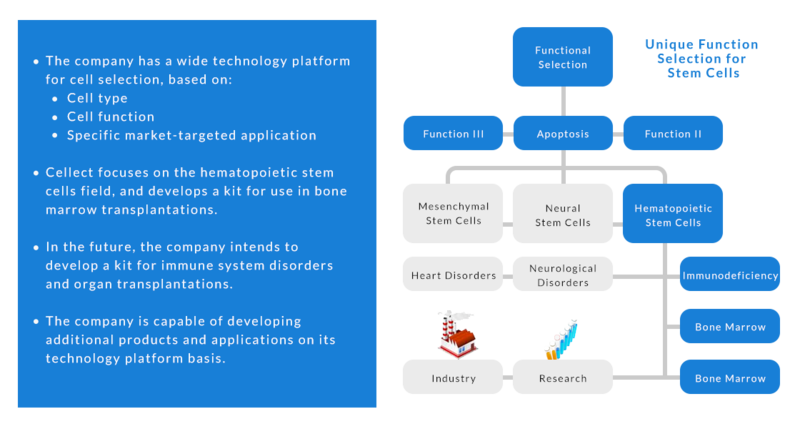 These lines of research are expected to drive a pipeline of products with short term (medical devices) and long term (cellular therapies) contributions to the Company’s scientific, IP and business strength. ‍Pearl-Yafe M, et al. Fas ligand enhances hematopoietic cell engraftment through abrogation of alloimmune responses and nonimmunogenic interactions. Stem Cells. 2007;25:1448-1455. Pearl-Yafe M, et al. Expression of Fas and Fas-ligand in donor hematopoietic stem and progenitor cells is dissociated from the sensitivity to apoptosis Experimental Hematology 2007;35:1601-1612. Pearl-Yafe M, et al. Fas transduces dual apoptotic and trophic signals in hematopoietic progenitors. Stem Cells 2007;25:3194-3203. Pearl-Yafe M, et al. Tumor necrosis factor receptors support murine hematopoietic progenitor function in the early stages of engraftment. Stem Cells 2010; 28:1270-1280. Mizrahi K, et al. Regulatory functions of TRAIL in hematopoietic progenitors: murine transplants and human umbilical cord blood. Leukemia 2010; 24:1325-1334. Yarkoni S, et al. IL-2-targeted therapy ameliorates the severity of graft-versus-host disease: ex vivo selective depletion of host-reactive T cells and in vivo therapy.Biol Blood Marrow Transplant. 2012;18:523-535. Askenasy N, et al. Depletion of naïve lymphocytes with Fas-ligand ex vivo prevents GvHD without impairing T cell support of engraftment or GVT activity. Biol Blood Marrow Transplant. 2013;19:185-195. Ash S, Gigi V, et al. Graft versus neuroblastoma reaction is efficiently elicited by allogeneic bone marrow transplantation through cytolytic activity in the absence of GVHD. Cancer Immunol Immunother. 2009;58:2073–2084. Ash S, et al. Immunomodulation with dendritic cells and donor lymphocyte infusion converge to induce graft versus neurobastoma reactions without GVHD after allogeneic bone marrow transplantation. Br J Cancer. 2010;103:1597-1605.